The iQue Player (Chinese: 神游机, lit. 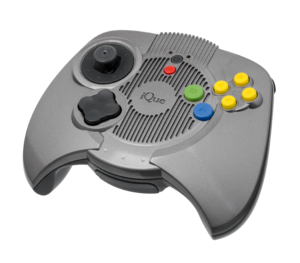 "iQue Console") is a game console created by iQue and BroadOn (formerly Routefree, later iGware, now Acer Cloud) in partnership with Nintendo, only released in China in late 2003. iQue company was co-founded by engineer Dr. Wei Yen, an USA-CHN scientist mainly involved in the development of the N64 GFX chip "Reality Engine"; he is also the founder of ArtX, a company that was commissioned by Nintendo to produce the GameCube GPU named "Flipper". The reason for this union was dictated by the fact that, since 2000, the Chinese market "suffered" from a ban on gaming consoles because they were considered harmful to the psyche of children (the ban ceased in 2015); Nintendo needed to circumvent the problem and to be able to insert its consoles in the vast market of China (here it is a plausible explanation on how it seems to have done). The opportunity came with iQue products, of which the "iQue Player" represents the progenitor and corresponds to the Chinese version of the Nintendo 64 (there are also iQue GBA, GBA SP, GB Micro, iQue DS, DS Lite, the iQue 3DS)! This console is not a normal N64 but a "compressed" version of it in a single chip: based on the Nintendo 64, the iQue Player adds features like removable NAND flash memory, PC connectivity (via USB), slightly better performance, and 14 different games translated into Simplified Chinese.